J-U-B developed a master plan and construction documents for the City of Saratoga Springs’ main park located in the heart of the City. 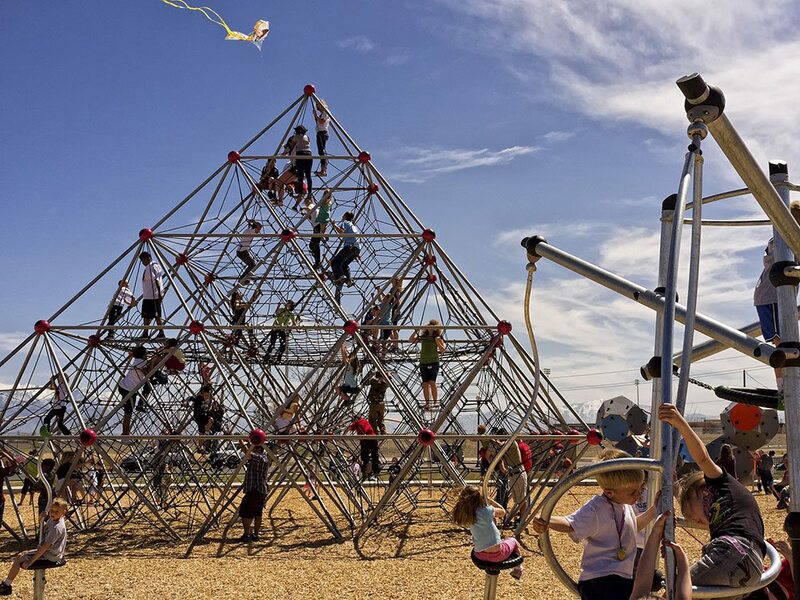 This exciting playground would be the driving force that would set Neptune Park apart and put it on the map of destination parks within Utah and throughout the region. Park elements include: two full-sized soccer fields, two large group pavilions, a full-sized basketball court (sponsored by the Utah Jazz), a formal plaza area, a community event area with stage and overhead structure, vendor locations, a restroom and storage building, and a 90-stall parking lot. The Issues: The City wanted to create a destination park that would attract not only local residents but other users from outside the city. They also needed to accommodate the various program criteria elements set by the City. To provide the added interest and attraction needed to become a true destination and not just another park, a unique feature was incorporated into the park design—a 30 foot climbing pyramid known as the “Neptune” pyramid. The Results: The park is now constructed and enjoying phenomenal success with local residents and neighboring towns as well. The Benefits: Saratoga Springs now has a large, dynamic playground suitable for all ages and capabilities with unique playground equipment found in only select parks throughout the world. Awards or recognitions: Neptune Park has been featured nationally and internationally in trade magazines and news articles, including Landscape Architecture and Specifier News and the Wall Street Journal.